Hello, there. It’s been awhile, I know. What prompted me to dive back into blogging’s depthless waters was a long wait at the post office. On the wall was a poster displaying Canada Post’s recent issue of its annual flower stamps. The lush colours were as seductive to my snow-weary eyes as an oasis to a thirsty tourist on an unfortunate desert tour. “Ooh”, I thought as I waited in line, melting snow dripping from my boots. “Water lilies. How lovely. How exotic!” How wrong. 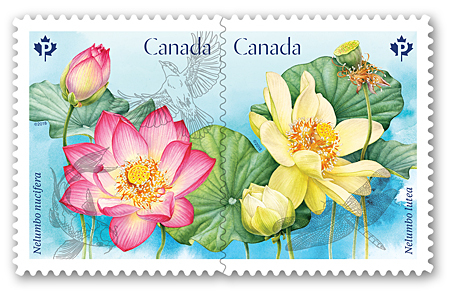 Lotus blossoms featured on a Spring 2018 issue of Canadian stamps. Image courtesy of Canada Post. I was so wrong. I wasn’t staring at illustrations of lilies. They were lotuses. And one of them (the yellow flower, shown at right) is actually a perennial native to southern Ontario (although rare) and the eastern half of the U.S (zones 4 to 10). Nelumbo lutea, known as American Lotus, is easiest to find in still water along the banks of the Mississippi, Missouri and Illinois rivers. In the States, American lotus can be so robust it’s invasive. Because of this, in Connecticut it’s prohibited and in Rhode Island it’s considered a Nuisance Species. Why? It can colonize rapidly, covering sensitive wetlands and shading out lower-growing plants because of its upright habit creating umbrellas with its leaves. On the plus side, it’s edible. The huge tuberous roots can be baked like potatoes and reportedly the leaves taste like spinach and the seeds like nuts. Some First Nations peoples once considered Nelumbo lutea a staple, when available. Plenty of wildlife still consider this plant good eating. Caterpillars of two moths consume its foliage and rhizomes. The seeds are eaten by Canada geese and various ducks. Muskrats take a nibble on occasion. Honeybees and other kinds of bees love its pollen and help to cross-pollinate the plants. So why did Homer’s Odysseus have all kinds of trouble after some of his men joined the party on the island of the Lotus Eaters? Once they’d eaten some lotuses, they immediately forgot about their homes, their cares, their very purpose in life. He had to drag these day trippers back to their ship and tie them down before setting sail after which, presumably, he had to deal with a bunch of guys unhappily going through withdrawal. Had they gotten their buzz from Nelumbo nucifera (Sacred Lotus, the pink flower shown above right)? Maybe. The seeds of the Sacred Lotus, national flower of India and significant symbol for Buddhists and Hindus, have an alkaloid called Neferine, which can have a sedative effect. Pink water lilies at Coastal Maine Botanical Garden. Photographed June, 2016. How do you tell a lotus from a water lily? Lotus flowers and their leaves are emergent, meaning that they’re both held aloft above the water’s surface by strong stems. Water lily leaves and blooms, in contrast, float on the water’s surface. What’s the difference between an American lotus and a Sacred Lotus? The most obvious difference, as they occur naturally, is that American lotus are yellow. Sacred lotus are pink. What about water lilies native to Canada? There are four genera and nine species of water lily native to Canada. Three of the most important are: 1. Nuphar variegatum (Yellow pond lily, spatterdock) found over most of Canada and as far north as the Yukon Territory. 2. Nymphaea tetragonal (White or pygmy water lily) found in northern Canada. 3. Nymphaea odorata (Fragrant water lily, can be white or pink) found in southeastern Canada. Are they edible, too? Yup. 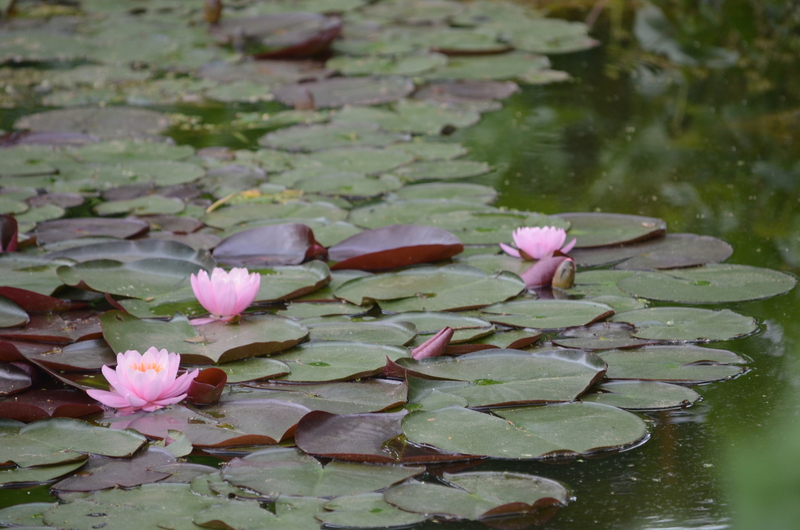 If I need to choose between growing lotuses or lilies, what else should I keep in mind? Lotus can get really tall. However, both lotus and water lily have dwarf varieties available. Although water lilies native to Canada can occur as far north as Nunavit, if you’re concerned about how well lilies will do in your garden, look for hardy water lilies which can be comfortable in zones 4 and up. In Canada, Lotus can be grown in zones 5 and up in ponds (although be prepared for the plant to take over) or large containers positioned in full sun. A good guide to growing American Lotus can be found here, on the Chicago Botanic Garden website. 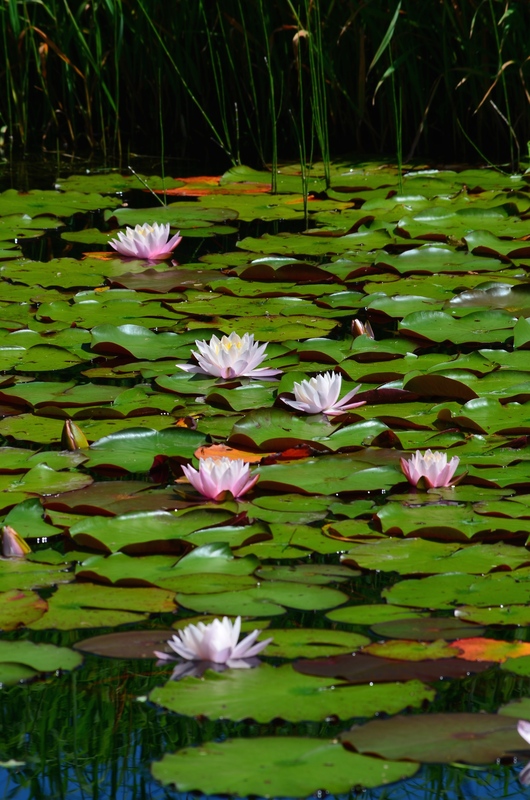 Ontario-based The Bloomin Bog, an online water gardening resource and shop, has good advice for growing lotus, including the size of water feature needed for various lotus varieties.